Underlined introduces the NPS Driver & Impact Data Science Model API service. Always wanted to know what has the most impact on your NPS and what you can do to influence it? After years of experience with clients and in collaboration with leading universities, Underlined developed a module on the Underlined Hub for CX Analytics that provides insight into the relationships between the NPS and omnichannel customer behavior. What does the NPS driver & impact model do? This model makes clear which important events in the omnichannel customer journey have the greatest impact on a KPI. 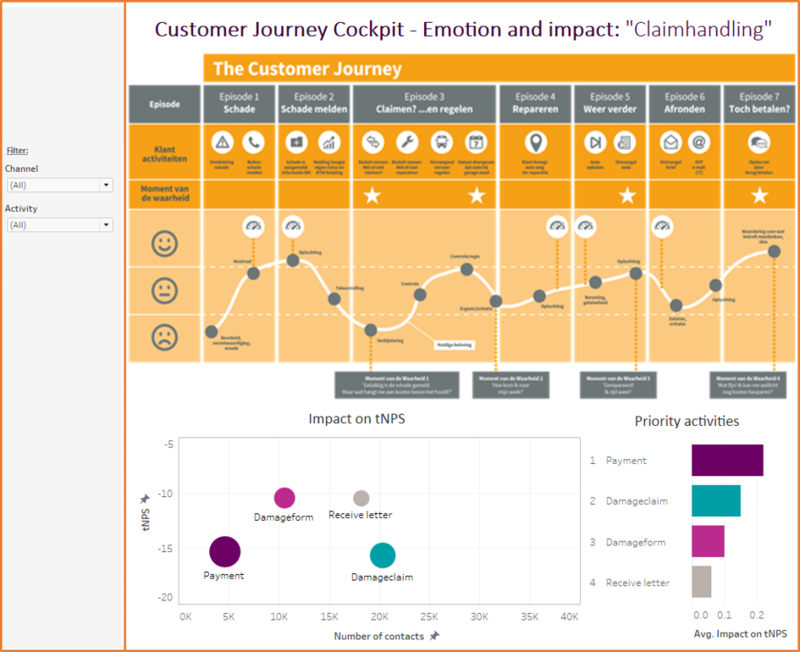 Based on all customer, relationship, and contract/product information offered, the model can calculate what has had the most impact on the NPS. In the example above you can see, for example, that during a damage claims process by an insurance company, everything around the moment of payment has had the most impact on NPS scores. By adding this information to your dataset, it is not only possible to determine what has the most impact on the KPI, but most important steps in the payment journey which should be addressed. Certainly by working with the feedback from open questions around this topic (e.g. by using the Text Mining API Service for customer feedback to further enrich your dates) you get a clear picture where the actual opportunities lie. The driver model can also be used for other key customer KPIs, such as the CES (Customer Effort Score) or CS (Customer Satisfaction). All parts of the Underlined Hub for CX Analytics work together seamlessly. If you are already using other API services from Underlined, the results of these modules are included in the driver models. Want to know more about how this technology works and can be applied within your organisation? Please contact us for a demonstration and explanation of the possibilities. If you would like to see examples of our customers who are already working with our techniques, click here!